Moving Medium has built several apps for iOS. 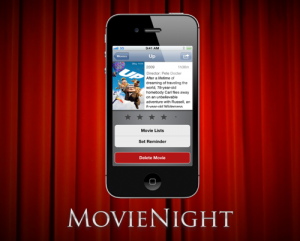 Our first release was MovieNight, an iphone app to keep track of movies, the invitation-feature added a social component. Write on Track, our second release, is an iPhone/iPad tool for writers to keep track of their progress in various writing projects. MovieNight for iPhone/iPod Touch lets you track, find and get reminders about the movies youwant to see. Reminders make sure you never miss the release date, and using the ‘MovieNight’ feature, you can easily invite your friends to come watch a movie with you. Write on Track is a small tool aimed specifically at writers. Whether you’re working on your next great novel, or just trying to finish your master’s thesis, Write on Track keeps you on track. 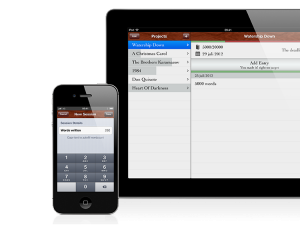 It features projects with deadlines and target word counts. Add new counts as you write, and your daily target will update to keep you on track, no matter what happens. Since not all iOS text editors feature word counters, you can copy the text you wrote to get a new word count, without having to do anything else.